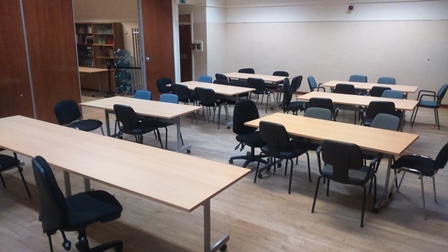 A spacious, well lit training area – can seat thirty people with tables and can be configured in various layouts. The configuration shown in the photo is called ‘cabaret style’. A sprung floor means this can also be used as a dance studio, if required. Please contact us on 020 8549 1888 or premises@urckingston.org.uk to make a booking. You can see our full Terms and Conditions of hire. There is also extra equipment available and a breakdown of charges for arranging rooms.